Morocco's Raja Casablanca beat AS Vita Club of the Democratic Republic of Congo 3-0 on Sunday in the first leg of the 2018 African Confederation Cup final. 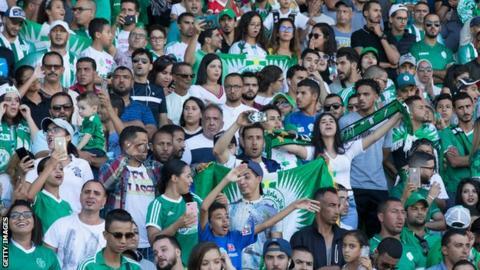 In front of 45,000 fans, including Morocco's head coach Herve Renard, Raja made the most of home advantage to secure a big lead ahead of the second leg. The result also keeps Raja coach Juan Carlos Garrido on track to becoming the first coach to win the African Confederation Cup with two clubs. The Spaniard also guided Al Ahly of Egypt to success in the second-tier African club competition four years ago. Soufiane Rahimi scored twice for Raja Casablanca, his first goal coming two minutes after the break, as he pounced on a back-heel from Mahmoud Benhalib to poke the ball home. There was then a brief delay to play to allow smoke from a flare to clear, and when they resumed, Raja added to the score. Rahimi's second came after 61 minutes, a strong shot from outside the area giving the hosts a 2-0 lead. Things got worse for the visitors when Yannick Bangala Litombo gave away a penalty two minutes later and was sent off for two yellow cards. Mahmoud Benhalib put the spot-kick away to make it 3-0 to Raja and become the top-scorer in the competition this season with 12 goals. Even with 10-men, Vita Club pushed forward, refusing to make it easy for the hosts. At the final whistle, there were mass celebrations on the pitch from the Raja players as Vita Club's contingent expressed their unhappiness to the referee. The result leaves AS Vita Club with a big challenge when they host the second leg in Kinshasa on Sunday 2 December.